The diencephalon is the posterior portion of the prosencephalon. It is first detected on E9.5 in mouse and gives rise to the hypothalamus, thalamus and the retina. 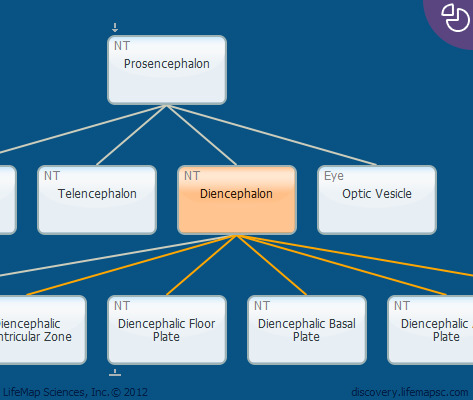 In this database, the diencephalon is subdivided into four longitudinal columnar territories, which from the ventral to dorsal direction are the: floor plate, basal plate, alar plate, and roof plate (which are also present along the whole neural tube). The meso-diencephalic dopaminergic neurons originate, in part, in the caudal portion of the diencephalon and migrate through their differentiation to their final location in the midbrain.